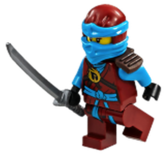 Nya (pronounced Nee-ah) is a minifigure from the Ninjago theme first introduced in 2011. She is Kai's sister and a Master of Water. As Nya, her hair-piece sports straight black hair. She has a double-sided head, and is the only character in Ninjago besides Lloyd Garmadon to have this. On one side, she wears a red veil that covers her mouth. On the reverse side, her whole face is visible, revealing a neutral or angry expression. She has been depicted wearing a sleeveless, red dress which is decorated with a phoenix pattern. As Samurai X, she has a samurai helmet, similar to Lord Garmadon, with a unique red piece that covers her mouth and where her nose should be. She has a golden piece on top of the helmet similar to the Lord Garmadon's Helmet of Shadows. She wears a red shirt that contains a back printing, bearing a phoenix pattern and parts of her torso. She has a special piece that goes down over her torso as armour and her legs are red. She has a double-sided head that, on one side, bears a regular expression and on the other an angry expression. Her 2014 variation is almost exactly the same as the original Samurai X, but instead of having her special armour piece, she has the same silver shoulder armour that Cole and Jay have in many of their variations. The 2015 Samurai X is very different from the original. Her face and helmet are the same, but her torso and leg pieces are completely different. Her legs and torso are black, but her torso has red and gold artwork. Her arms are also red, but her hands are black. Like her 2014 variation, this version comes with shoulder armour. 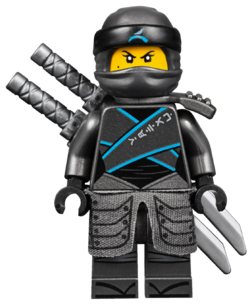 This armour is slightly darker than the previous, resembling the armour that Lloyd Garmadon wears. In the LEGO Battles: Ninjago game, Nya is shown wearing the minifigure's nurse outfit, and a white dress. In Spinjitzu Scavenger Hunt players can select blue or black dresses that supposedly belong to her. Later, while Sensei Wu and the four Ninja, Kai, Jay, Cole, and Zane are sleeping in the Forest of Tranquility, location of the Sword of Fire, Kai is woken by Nya. She runs away, and Kai chases her through the forest, eventually entering the fire temple. Nya is then revealed to be an illusion made by Lord Garmadon in a shadow form. He exploits the fact that Kai had forgotten his sword, and that the real Nya is hanging from chains above the lava in the temple. Garmadon tells him the only way to save Nya is to pull the Sword of Fire out of its rock. 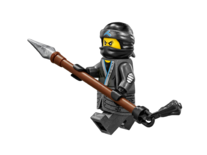 Kai obtains the sword, cuts Nya free and is then confronted by shadows controlled by Garmadon. Sensei Wu arrives to save them, and jumps on a rock that is going down a lava fall so he may go to the Underworld. Nya then returned to her village where she waited for Kai and the other ninjas to return. In the episode, "Rise of the Snakes", the Ninja are warned by Sensei Wu not to let their laziness get the best of them, Nya rushes in and informs them that Lord Garmadon has been spotted in Jamanakai Village. After the Ninja had dealt with Lloyd Garmadon instead, Nya decides to visit the village and sees Lloyd had already returned with the Hypnobrai. When the Ninja hear of the Serpentine threat from Sensei Wu, Kai realizes that Nya is currently there, and the four of them head out on their Dragons. After witnessing the Serpentine and the villagers they had hypnotized, they meet up with Nya. She tells them not to look the Hypnobrai in the eyes when they rattle their tails, and also mentions that the General of the tribe is holding the Hypnobrai Snake Staff, which contains the anti-venom to cure the villagers. Jay then offers for her to be an honorary member of their team, much to her annoyance. Cole manages to take the Hypnobrai Staff from Slithraa, but just as Skales hypnotizes him, Nya comes in and kicks Skales in the face, causing him to retreat. She then tells Cole to use the staff on the fountain in town, so the anti-venom can be distributed through the water supply and restore the villagers back to their normal selves. In "Can of Worms", Pythor P. Chumsworth steals the Map of Dens from Lloyd, Nya figures out the locations of the Constrictai and Venomari tombs. Later, when the Ninja are trapped in the Toxic Bogs, Samurai X scares off the Serpentine and saves the Ninja. When the Ninja approach the Samurai to thank her, she sprays them with a sleeping gas. She then flies off, and the Destiny's Bounty arrives. In Episode Six, the Ninja get their new ZX suits, and Nya reports that Serpentine are terrorizing the Mega-Monster Amusement Park. The Ninja are more than ready to reply to the call. Upon arriving, however, the Ninja find that Samurai X has taken care of the snakes, tying them up in rope. The Ninja are under the belief that whoever catches the Samurai will be the Green Ninja, and so place a bet. A montage shows how they try in different ways to capture the Samurai, but to no avail. Back at the Destiny's Bounty, the Ninja complain about their failed attempts to try and capture the Samurai. After realizing Lloyd isn't with them, the Ninja track him down to The Lost City of Ouroboros. However, upon arriving they realize it's a trap when they are captured by Pythor. Pythor announces another Slither Pit for the entertainment of the Serpentine, to find out whether the Ninja or Samurai is stronger than the other. Although seeming to fight, Samurai X reveals he was just putting on a show until an opportunity presented itself, and helps the Ninja escape. After the Samurai's exo-suit malfunctioned, they landed in the desert. Cole, Zane, and Jay landed together in the desert, but Kai landed nearby the Samurai, when he discovers that Nya is Samurai X. After a discussion, Kai promises not to tell the others about her secret. In Episode Eight, she explains to the Ninja (who aren't paying attention) about a way to cure a Fangpyre bite and afterward Jay asks her out on a date. They were originally going to go to a fancy restaurant, but after the Serpentine broke into the Mega Monster Amusement Park, they went there instead. Nya is captured by the Serpentine and Jay makes an attempt to save her. She reveals that she is the Samurai to him and he is shocked. Nya kissed him and unlocked his True Potential. At the end of the episode all of the other Ninja find out she is the Samurai. In Episode Nine, she is briefly seen saying that they only need one Fang Blade to prevent The Great Devourer from getting unleashed. In episode Ten she is helping the Ninja train and also warns them about the Fire Temple's being dangerous. Sensei Wu also explains how the Green Ninja is chosen and suggests that she might be the Chosen One. However, she chooses not to go through a rite in order to see if that is true, since she has decided she does not want to be a Ninja. In the episode "All of Nothing", She is captured with the ninja, and is the only one who has faith in Lloyd. In the episode "Rise of the Great Devourer", she is seen fighting the Serpentine along with the Ninja. In season 2, her role is far more menial, as she does not play a cental role in the plot, and only used her Samurai Mech once, and it was very brief. However, as the final battle drew closer, she once again played a major part in the plot, although she became an antagonist. In "Return of the Overlord", Nya was transformed using Dark Matter and turns into a zombie like version which fights the Ninja. Since the Ninja don't want to hurt her, they gain a disadvantage. After a long struggle, in which the Ninja are initially outmatched, she gets frozen in ice. At the end of the episode, she jumps into the portal to Ninjago before it closes. In the next episode, Nya stands guard over the Garmatron with a turret attached to the fortress, and proves to be the Overlord's strongest soldier, destroying Lloyd's golden mech. She even took down the entire Stone Army when Dareth took control of them. Later, Cole, then Jay were turned evil by the Overlord's dark rays, and Zane had to stay behind to hold them off, which left only Kai and Lloyd, who was still injured after his defeat from the Overlord. Nya ambushed them with her turret, and attacked the injured Lloyd. Kai draws her fire, and cuts the turret off of the building with his elemental fire blade, allowing Lloyd to proceed to battle the Overlord. This time, Lloyd won, and Nya was returned to normal. With the Ninja trapped on the comet, Jay and Cole began inquiring over who she would miss most, though Nya refused to give a definitive answer. However, the ninja soon managed to create a new spaceship and escape the comet, and Nya cheered along with the others at their success. Donning her Samurai X mech, Nya hurried to the outskirts of New Ninjago City with Wu, Garmadon, and P.I.X.A.L. where they reunited with the Ninja. After receiving a message from a now restored Borg urging them to the Temple of Fortitude, the heroes set off into the city, though Nya's mech was disabled shortly after they passed the Overlord's wall. As she emerged from her ruined mech, Nya encountered Cryptor again and the two fought, with Cryptor easily gaining the upper hand. However as Cryptor began taunting her, Nya tricked Min-Droid into fighting the Nindroid General and she managed to escape, arriving at the Temple in a Destructoid just as the Ninja were leaving. Nya then met up with P.I.X.A.L. and Borg, where they witness Zane sacrifice himself to defeat the Overlord. "Ninjago: Secrets of the Blacksmith"
"Return to the Fire Temple"
"The Rise of the Great Devourer"
"The Curse of the Golden Master"
"On a Wish and a Prayer"
Nya is Kai's sister and helped run their family blacksmith shop, Four Weapons, after their father died. She was kidnapped by the Skulkins in the first episode. Getting her back became Kai's motive to join Sensei Wu as a Ninja. Had she never been kidnapped, Kai would've likely never completed his training. She was more willing to train with Wu than her brother. Nya is the only character (except for Sensei Wu) to have more than one golden weapon in their spinner set. She appears in the Ninjago Monastery of LEGO Universe as a vendor. As Samurai X in the TV series, she has a pair of mechanical goggles that were not present on her minifigure until 2015. These help hide the face and feminine eyebrows that made X's real identity obvious on the minifigure. She also uses a voice disguiser in the show. In the TV series Samurai X is simply known as "Samurai"; she only has the X in the sets. Samurai X's equipment bears a golden symbol that is also on Nya's normal outfit. The Ninja apparently never made the connection. Sensei Wu knew of Samurai X's identity all along. Kai was the first of the Ninja to discover it. After Samurai X's true identity had been revealed, Sensei Wu speculated that she might be the Green Ninja. The Golden Weapons, however, revealed that it was not her, but Lloyd Garmadon. As of Episode 8: Once Bitten, Twice Shy, Nya has been in a relationship with Jay. The dress Nya wears on her date with Jay was the same dress worn by Willie Scott in the Indiana Jones theme. In Episode 16, Bizzaro Jay kissed Nya, greatly angering the real Jay. Jay's anger combined with the fact that this distracted Bizzaro Jay, gave Jay the opening he needed to destroy his Bizarro clone. Nya is the first to come into contact with the dark matter by the Stone Army warriors under Garmadon's orders, thus turning into Garmadon's own evil image, where she resembles a purple-eyed zombie. She is cured at the Overlord's defeat. She was able to use Spinjitzu while corrupted by dark matter, her tornado was colored crimson. [source?] She properly learned Spinjitzu during her training to be the water ninja, where her tornado was a pale blue colour. In the third season, she has romantic feelings for Cole. Nya is the sister of Kai (the Ninja of Fire), and she doesn't understand why her brother should get to have all the fun. That's why, even though she is not a ninja, Nya is ready to fight. She has two fiery daggers…and she knows how to use them. Also, Nya's favorite color is blue, and her favorite ninja is not her brother; it's Jay, the Ninja of Lightning. Make no mistake - this girl is no damsel in distress. She proved that when she and Flame the fire dragon helped rescue Kai from Lord Garmadon. And she's not one to take no for an answer. Nya is fed up with the Ninja's boys' club syndrome and is determined to show everyone she can do anything they can do - only better. She trains hard to beat her brother's records, and Sensei Wu constantly reminds her that if she is patient, her time will come. This page was last edited on 6 February 2018, at 11:01.